I Just got the news that Micah Kennedy passed away last night. I first met Micah in 1993 at a hastily thrown together Midtown music ‘festival’ called the Garage Sale-A-Go-Go. Micah and his buddies rolled up on vintage bikes, sporting 60’s polaroid sunglasses and generally looked as if they had just ridden out of an episode of My Three Sons. Turned out that they were a surf band, or were about to become one, and were looking for a bass player. Enter Tim White, who was about to go onstage with his frat/garage combo, The Trainspotters. White was a perfect fit for the band that was soon named the Tiki Men, and within weeks they had made their first recordings at Micah’s warehouse lair, the Sing Hing Bean Sprout Factory. Though Scott Miller and Pete Husing had formed the Tiki Men with Micah, it was clearly Micah’s band. 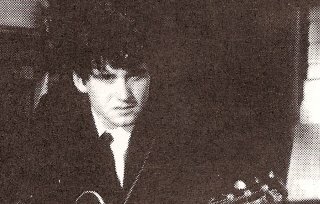 He wrote and arranged most of the songs, played lead guitar, recorded and produced the records, and generally set the tone for the group. Never quite comfortable in band ‘outfits’ like the Hawaiian shirts they wore early on, Micah gave the group an edge that no other ‘retro’ band of the period could touch. And his playing didn’t hurt either. Probably the best rock and roll guitarist that Sacramento has ever produced, Micah’s work in the Tiki Men and in later groups such as the Lazy J’s cemented his reputation from nearly the moment he set foot on stage. For a time, anything Micah touched seemed to be solid gold. 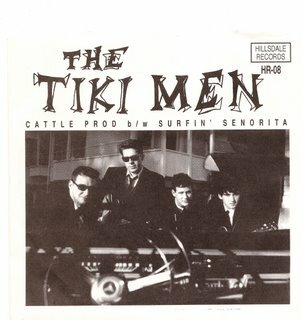 The Tiki Men immediately found themselves the darlings of the 90’s garage/surf revival, playing the prestigious GarageShock festival in Bellingham and releasing records on a variety of labels. He produced the debut single from Tiger Trap, Sac’s now legendary riot girl band, and the first record from Lil Bunnies- which ended up at #1 on Rolling Stone‘s punk charts for a week. Relocating to San Francisco in the late nineties, he formed the Original Sinners, a sort of proto-Alkali Flats with future Flatter Chris Harvey. Their whiskey-soaked hillbilly blues were devastating, with Micah and Chris channeling the spirit of the Louvin Brothers. Health and other issues challenged Micah over the past decade, and though he never stopped playing music, his output decreased dramatically. He and I were never particularly close, but we kept in touch, and I enjoyed running into him now and again, almost invariably when he was working on an old car or motorcycle. Micah was a sensitive soul, much beloved by his friends and family. Very sentimental, he’d stayed close to friends he’d met as far back as preschool, and he died surrounded by those close to him. When my first band put out our first record in 1995, it came with a questionnaire which asked each of us our musical goals. My answer was short: “To play guitar like Micah.” The answer would be the same today.